Rooney Mara stars as Mary Magdalene in the Biblical drama. JERUSALEM — On the shores of the Sea of Galilee in Israel, a renewed interest in Mary Magdalene is changing her home town’s landscape. Here, by the serene lake– arid Israel’s major freshwater reservoir – the Legionnaires of Christ, a Roman Catholic order founded in Mexico, is developing a $100-million pilgrimage retreat with an emphasis on women and feminism. Since, 2009, Fr. Juan María Solana of Mexico and Fr. Eanon Kelly of Ireland have been meticulously developing Magdala — The Crossroads of Jewish and Christian History. More than a lakeside hotel, the church and spiritual getaway includes archaeological remains of the town destroyed by the Romans where Mary Magdalene lived. The 151 rooms will be inaugurated in July. ‘Mary Magdalene’ biopic film releases in U.S. Meanwhile, a film about Mary Magdalene, the first woman in the Bible to see Jesus after his resurrection and not to be confused with Jesus’ mother, is set to hit U.S. and Canadian theaters April 12. With a twinge of feminism, Mary Magdalene shows the perspective of one of Jesus’s female followers in a sea of 12 male apostles in Jesus’s inner circle. It also attempts to stamp out the popular fallacy that Mary was a prostitute prior to becoming a disciple of Jesus during the three years he travelled near Capernaum. The biopic, starring Rooney Mara as Mary, Joaquin Phoenix as Jesus and directed by Lion’s Garth Davis, lost its distributor in North America last year when sexual assault allegations and the ensuing Me Too movement bankrupted The Harvey Weinstein Company. It was scheduled to premiere in the US in 2017 but then premiered in London instead in 2018. The film was released in much of Europe and Australia last year. Also, notably, two women writers wrote the screenplay, Helen Edmundson and Philippa Goslett. Unlike the 1914 silent film Mary Magdalene (loosely based on the 1910 three-act play of the same name by Belgian playwright Maurice Maeterlinck), in director Garth Davis’s telling, Mary is not portrayed as a repentant whore. That confused medieval legend, still resonant today, was repudiated by the Vatican in 1969 when the identification of Mary Magdalene with Mary of Bethany and the "sinful woman" was removed from the General Roman Calendar. Mary is often mistakenly conflated with another woman of the same name who lived with her sister Martha in the village of Bethany on the slopes of the Mount of Olives beside Jerusalem, and a third and unnamed New Testament figure known as the “sinful woman” who anoints Jesus's feet in Luke 7:36–50. A pop culture fascination with Mary Magdalene can be tied most recently to the 2003 best-selling mystery thriller The Da Vinci Code by Dan Brown, which centered around a supposed secret family of Jesus and provoked a tsunami of speculation about the story of Miriam from Migdal, Israel, better known as Mary Magdalene – a Jewish girl from a fisherman’s village on the Sea of Galilee who lived during the tumultuous Roman occupation of Judea 2,000 years ago. Mary likely traveled with Jesus on some of his journeys across the Galilee and Golan and accompanied him during his Passover pilgrimage to Jerusalem in c. 34 CE that ended with her beloved teacher’s crucifixion – and according to Christians – resurrection. So far the reviews have not been kind, though the movie probably goes beyond most reviewers’ Biblical literacy. Some Catholic reviews more substantially piece apart the film’s interpretation. Magdala is Father Solana and Father Kelly’s second major project in the Holy Land, and they stumbled upon it by accident. In 2004, Pope John Paul II entrusted Jerusalem’s ruined Notre Dame de France to the Congregation of the Legionaries of Christ for renovations and fundraising. Solana led the charge, and Kelly joined in 2007. They aim to turn the Notre Dame center into a venue for interfaith dialogue. At the northwest shore of Lake Kinneret (the local name for the Sea of Galilee) in 2009, Solana and Kelly set out to build a more modern version of Notre Dame. They spent $16 million to assemble four privately owned plots near the town of Migdal and the destroyed Palestinian village of al-Majdal – both named for the ancient town of Magdala wiped out by Rome in 66 CE at the onset of the First Jewish-Roman War. Solana’s intention was to demolish the 1960s-era holiday cabins of the old Hawaii Beach resort and erect in their stead a hotel for 300 guests, a restaurant and a lakeside spiritual center. When the building permit was issued, the final step before construction could begin was to carry out a salvage dig on the site. Neither the Vatican nor the archaeologists dispatched by the Israel Antiquities Authority expected to find anything significant. But archaeologists from the IAA and two Mexican universities were stunned to find the vestiges of first-century Magdala, where Jesus may have preached and Mary Magdalene once walked. The extensive remains of the lost city included a synagogue, ritual baths, houses, a marketplace, a warehouse and a wharf. 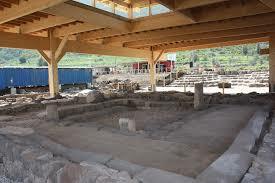 A fisherman’s workshop for producing the salty cured fish for which Magdala was famous was also found, attesting to the village's Greek name Tarichaea, meaning “pickled fish,” or fish cannery in more modern parlance. Nothing had been disturbed since the Romans sacked the city. Artifacts were uncovered just below the surface. The Magdala Stone at the Israel Antiquities Authority warehouse in Beit Shemesh. Photo by Gil Zohar. Remains of the ancient synagogue in Magdala. The ancient synagogue contained a limestone block relief with extensive carvings. These include a seven-branched menorah flanked by a pair of two-handled jugs and a pair of columns. The Magdala Stone may have served as a Torah reading table. The priceless artifact is today kept at the Israel Antiquities Authority warehouse near Beit Shemesh, with tight security. A facsimile is on display at Magdala. Many of the 80,000 pilgrims and tourists who come to the area each year, come to imagine Jesus and Mary Magdalene walking around the archaeological park and its synagogue. A chapel at Magdala with a boat-shaped altar. Mosaics were also found during the excavations, and their designs were incorporated in the Duc in Altum chapel that opened near the archaeological garden in 2010. Duc in Altum, meaning “Launch into the deep [waters],” was the instruction Jesus gave to his fishermen disciples (Luke 5:4). The chapel facing onto the lake contains an altar shaped like an ancient fishing boat, while the domed antechamber leading to the ecumenical prayer hall honors Mary Magdalene. Five km. north of Magdala is Kibbutz Ginosar, where a 2,000-year-old fishing boat contemporaneous to Jesus is on display. In 1986, a drought exposed vast stretches of the shoreline. Wannabe archaeologists Moshe and Yuval Lufan, brothers living in the village, set out to explore the muddy land that had previously been underwater. They discovered the newly-exposed hulk of an ancient ship. “The Jesus Boat.” Photo by Gil Zohar. To be clear, no one claims Jesus sailed on the boat. But fishing was a common profession in his time, and he would have been familiar with this type of vessel and how fishermen used these boats. The boat may have been destroyed in 66 CE in the same war that destroyed Migdal, in a naval battle between Jewish rebels and the Romans that the historian Josephus said dyed the lake red with blood. And what of Mary Magdalene? She too would have known these fishing boats. For those seeking to appreciate the life and times of Mary and her master, more insight may be found on the shores of Lake Kinneret than in Hollywood. The Magdala complex has already been in limited use while still under construction. The center hosted an event on International Women’s Day Mar. 8, and on April 28, Magdala is celebrating the Feast of the Holy Site. And if that’s too soon to get a passport, the Magdalena Institute is now accepting reservations for its 6th Annual Women’s Encounter: “Woman, Heart of the Family”, taking place March 6–8, 2020.